What could be better than bacon and eggs? 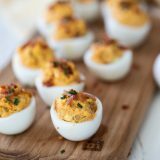 These Deviled Eggs with Bacon add salty bacon to a traditional deviled egg recipe for an appetizer that will disappear off the plate. Dice the bacon, then cook in a medium skillet over medium-high heat until it is crisp. Transfer to a paper towel lined plate and allow to cool. Peel the eggs and slice in half lengthwise. (I also like to cut them the short way sometimes just to switch things up!) Carefully scoop out the yolks and place in a medium bowl. Place the egg whites on a serving platter, cut side up. Use a fork to break up the yolks. Add in the mustard, relish, grated onion, mayonnaise, paprika, and hot sauce. Stir in the bacon, reserving a bit for garnishing. Taste and season with salt and pepper. Transfer the mixture to a large ziplock bag or a piping bag fitted with a large open tip. If using a ziplock bag, cut the corner off of the bag. Pipe the filling into the eggs. Garnish the eggs with the reserved bacon and chopped chives.